The Peruvian Inca Orchid was originally bred as a bed warmer and companion. Today it is a fairly rare breed, known in some countries as the Peruvian Hairless Dog. Peruvian Hairless Dogs are an ancient breed, believed to have been kept by the Inca and possibly having existing even before then. 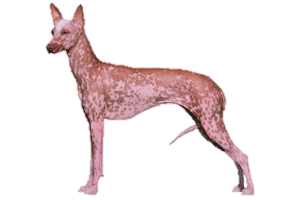 Their history is debated, some have tried to irrationally link them to other hairless breeds coming from Africa or Asia, however there is no evidence suggesting how these dogs would have arrived in the Americas. We know from ancient artifacts that the extinct Colima Dog from western Mexico had been present long before the arrival of Europeans, so it may be that the Peruvian Hairless shares ancestry with the Mexican Xoloitzcuintli. It seems far more likely that the hairless gene has appeared in different parts of the world at different times. For example, the American Hairless Terrier, which appeared in a litter of fully coated Rat Terriers in the 1970s. Is the Peruvian Inca Orchid Right for You?